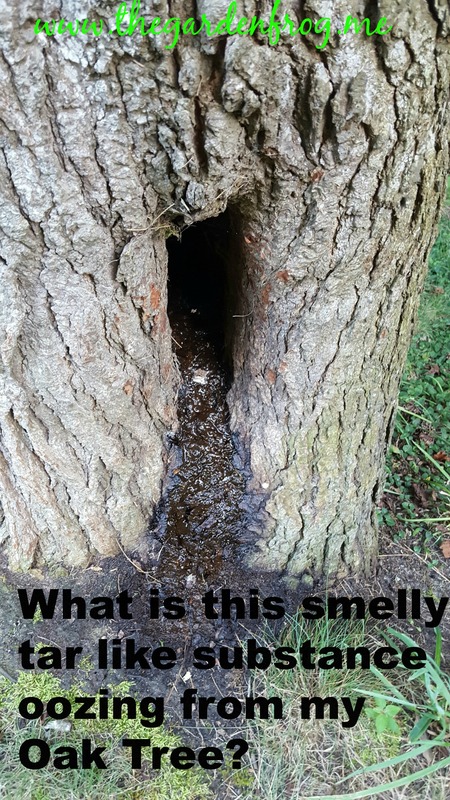 What is this smelly tar like substance leaking from my Oak Tree? 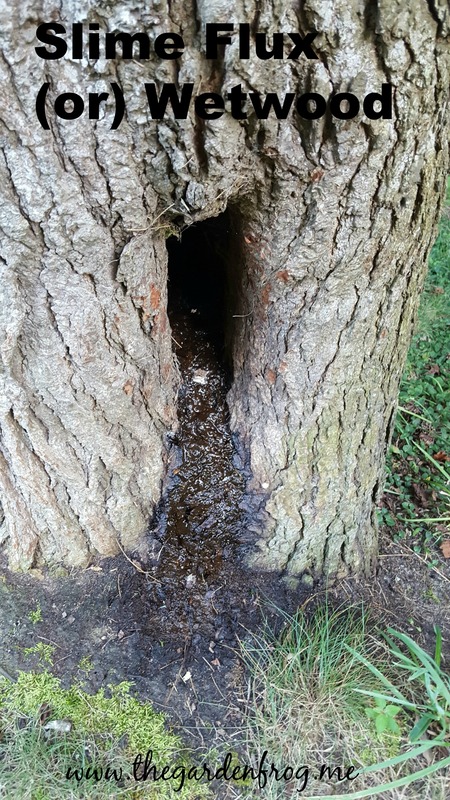 You are here: Home / Gardening Q&A / What is this smelly tar like substance leaking from my Oak tree? It is most likely ‘slime flux’ and it is a bacterial disease which in many cases does NOT cause long term or severe damage to the tree. Slime Flux Or Wetwood disease can affect Oaks, Tulip Populars, Elms, and Maples. There is nothing to do- really- just let the tree be and let nature takes it course. When I first encountered this last year, I panicked but read all that I could and decided that leaving the tree be was best. I was right. My Oak Tree is fine but this slime kills any plants it comes in contact. I also read that the tree is less valuable as lumber which is not really a concern I have in my suburban yard. You can google ‘Slime Flux’ and read more about the bacteria which seems to occur in my zone 7 under extreme drought conditions. This year (2016) we are in a severe summer drought and I have noticed several Oaks on my walks through the wooded areas oozing. I will be watching and updating any information to you if this has any adverse affects on the trees. The bacteria oozes out of cracks, splits, or injuries to the tree trunk and bark. My Oak tree developed Slime Flux last year I could not believe how awful smelling this disease is and how many insects were attracted to it. The tree healed within a month to 6 weeks. No adverse affects. I have seen trees develop this on different degrees and the tree pictured here has quite a stream going with signs of distress caused from the drought we are experiencing (leaves and branches wilting and leaves browning). In my experience with Slime Flux in Oaks, the trees heal themselves with no human interference. I suggest that you do not mound mulch up against the bark of any tree or shrub and be careful not to cause serious injury to the trunk of any tree with lawn equipment or tools. I looked up in my 70 year old gardening books and found that they state it is probably best to leave the tree be. Thanks for stopping by and if you ever have a question, just ask and I will try to answer it. It sounds terrifying and looks even worse. Thank you for sharing your experience with this disease. it looks worse than it is. just smells and attracts insect. yuck. but the trees so far have recovered.